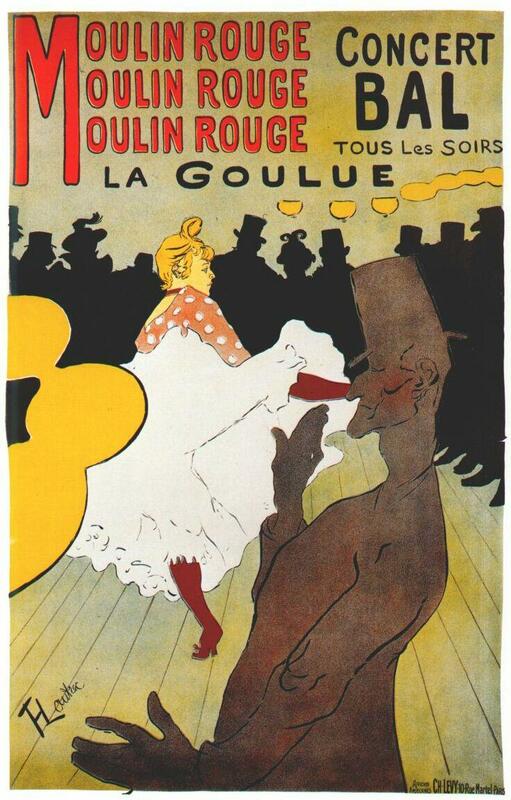 Cabaret shows are glamorous, classic, and symbolic of fin de siècle Paris. 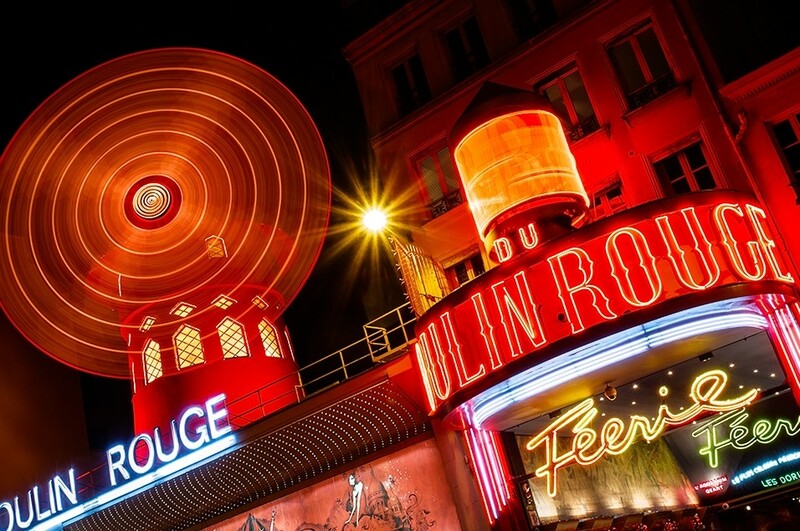 Look no further for a historic and diverting way to spend a night in Paris! Immortalized by Henri de Toulouse-Lautrec, the Moulin Rouge still stands today in all its original glory. Under the still-turning vanes you’ll find the birthplace of the modern Can-Can. Admittedly touristic, it is still a Parisian must-see. 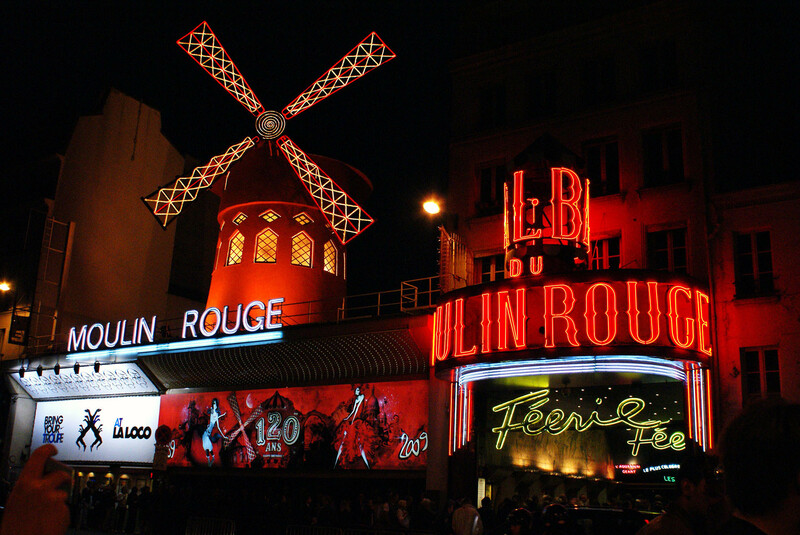 After all, it’s the Moulin Rouge. The show only costs 115€ per person, including a half bottle of champagne, or 165€ per person for fast track access and higher quality champagne. For dinner and the show, first class tickets cost 195€ each. For dinner and the show, an exclusive package (skip the lines, best seats in the house, etc) is a whopping 300€ per person. 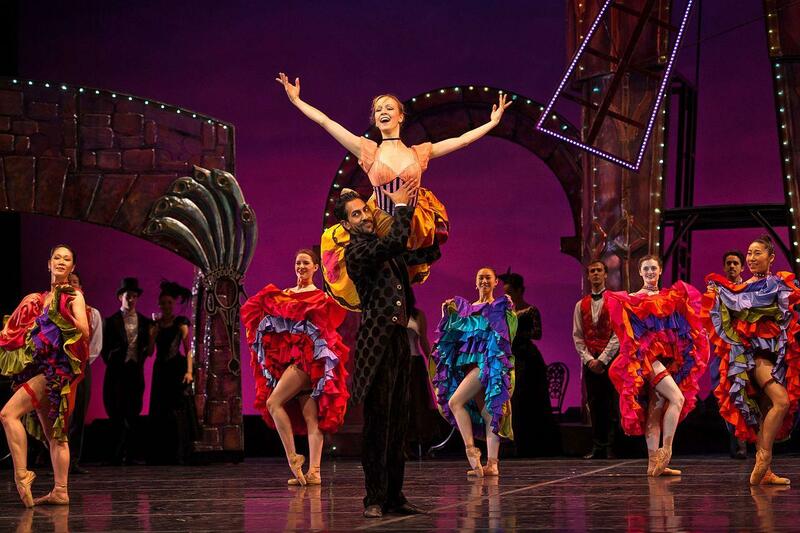 A third great option is the renowned cabaret, Crazy Horse. Here is an article devoted to it. Don’t forget to mute your devices, and enjoy the show! Do you like this article on cabaret shows in Paris? This company probably offers the most enjoyable cruise. The boat takes off close to the Eiffel tower. What makes this company special? The decor, for one, is marvelous, and the visibility from the boat is instantly enviable. Dinner itself is memorable, too; the experience, as any good evening spent in Paris should be, is a gastronomic one. Best of all, there’s a good amount of space between the tables, making for a more intimate night out. Enjoy a unique lunch on board. A relaxing moment ideal to break during your daily parisian visits. Amazing views, perfect service and exclusive and fresh cuisine will wait you. The menu consists of a variety of tasty starters, the choice of a main course and a ¨Café Gourmand¨ (coffee served with a selection of delicious delights). Place and time of departure: at 12.30pm in front of Musée d’Orsay. Tour duration: an hour and a half. 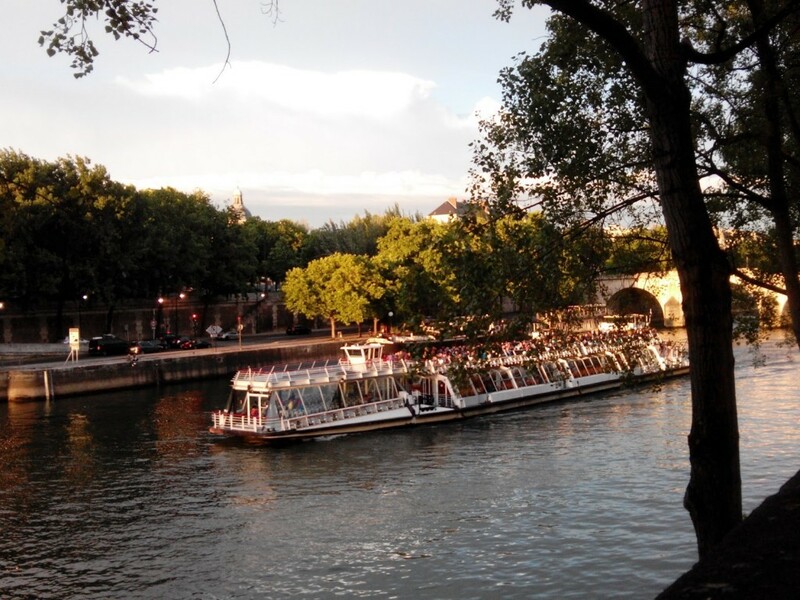 Enjoy a wonderful dinner on La Marina de Paris boat. 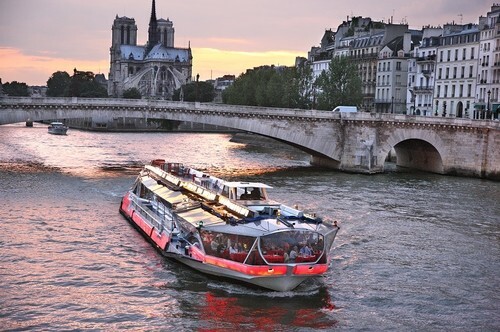 You will have the opportunity to admire the numerous lights of Paris during a cruise on the Seine river while you have a delicious dinner, made of typical french gastronomy accompanied from champagne or superior wine included. Magic night with the dinner cruise menu “saveurs gold”. These boats are much bigger. This is a great option for groups; they are specialized in large parties. You will enjoy upscale French cooking combined with sights of the city’s must-see attractions. 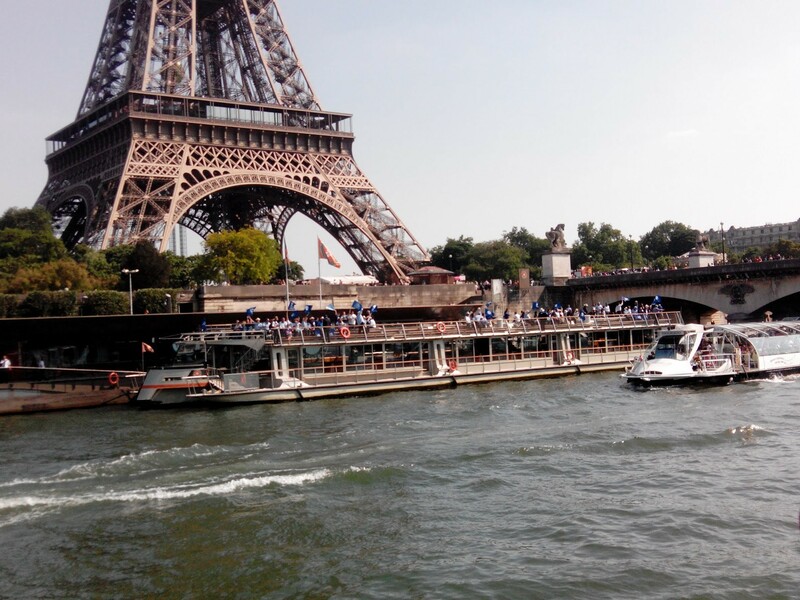 On board of Bateaux Parisiens boat, while you will enojoy a 3-course meal from an “à la carte menu” you will also listen a special small concert of pleasant live music. Place and time of departure: near the Eiffel Tower, strictly at 8:30pm and check in time: 7.45 – 8.15 pm. 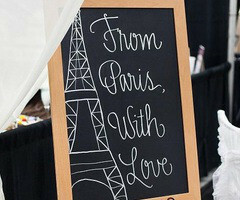 During your dinner-dance cruise with orchestra and singer, admire the bridges and main monuments along the Seine. The pure French traditional style is guaranteed on this delightful boat experience. The cooking team offers several “à la carte” dishes prepared on the moment on board. A band and a singer turn the night into a party for you to dance on the dance floor. Most people who come to Paris again and again, rarely become tired of it… However, if you want to explore and discover beyond the city limits, there are plently of day trips from Paris by train! I want to introduce you to my personal guide to trips from Paris by train, and each of them are close enough to go back and forth in a day. First of, there is a small town called Provins. It is an hour and 25 mins south-east of Paris, and you can depart from the train station Gare de l’Est. 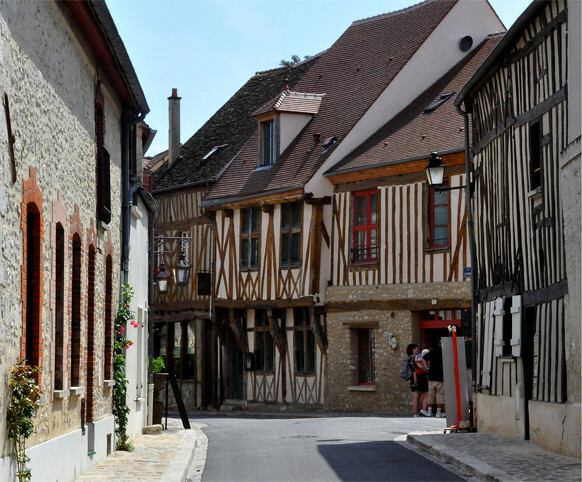 Provins is an ancient town, and get you back to the Middle Ages, with beautifully and amazing buildings, and winding streets. If you have the slightest interest in history, this would be the perfect day trip for you. Provins is also well-known for its rose-derived produce so use it as an excuse to stock up on rose petal jam. You can take a local train from Gare de l’Est – they leave every half an hour. You won’t save any money by booking in advance so you can just stroll up on the day. 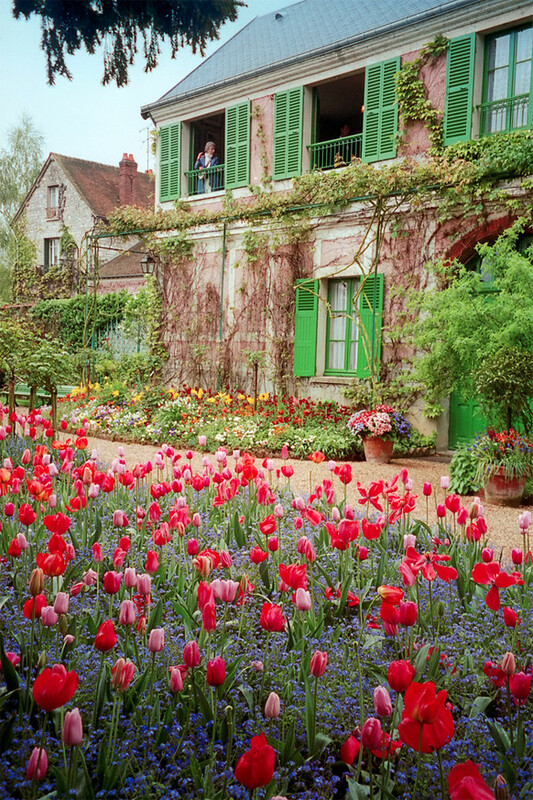 Next up is Giverny, which is also included in a day trip in our beneficial packages on ParisByM. You will be amazed by the very famous series of water lily paintings by the Claude Monet. Giverny is just 45 minutes from the train station Gare Saint Lazare station, and you can go with a fast train. The house and the garden is inspired by Monet’s life work. When you take the train, you will arrive in Vernon, from where it is approximately an hour walk from the train station. You can also rent bikes, because some companies offer bike rental just outside the train station, or else you can take a very short bus ride towards Giverny. You will hereby find this beautiful garden, which is very peaceful. At summertime the garden is in full bloom, which leaves you amazed, and the impression will for sure stay with you forever. Make sure not to miss! Auvers-sur Oise is the place, where painter Vincent Van Gogh famously worked and died. In 70 short days, Van Gogh painted prolifically, creating on average one work every day until his death. If you’re not a Van Gogh fan, you will still be amazed by this beautiful town, and it’s fields which inspired his work. You can head to the Auberge Ravoux, to see the famous apartment where Van Gogh lived his very final months, or you can enjoy your lunch there at table number five, which is where Van Gogh took his meals… Down the memory lane! If you pass by the village church, you will see the cemerety where the famous artist is buried. Amazing choice for a trip outside of Paris by train! On weekends and holidays from April – October a direct train to Auvers leaves from Gare du Nord around 10am, taking 35 minutes. All other times, visitors must take a train from either Gare du Nord or St. Lazare, then transfer to an Auvers-bound train at Valmondois, Pointoise or St. Ouen. You do not have to book in advance. Last recommendation for a day trip by train, is Fontainebleau-Avon. The amazing town is just forty minutes from Paris, and the forest of Fontainebleau is just moments from the station, which covers 100 square miles. You can enjoy a picnic in the former royal hunting grounds, or go towards the castle, which is the city’s main monument. 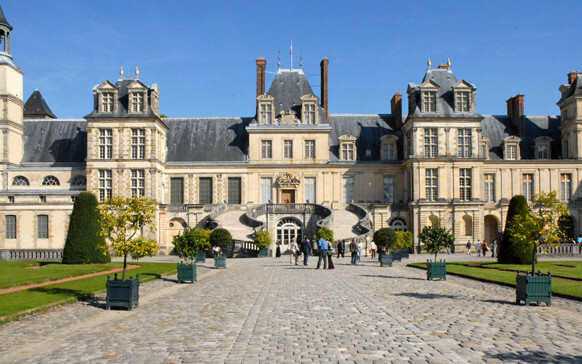 The Château de Fontainebleau was once the country seat to French royals, which goes back to the 16th century. 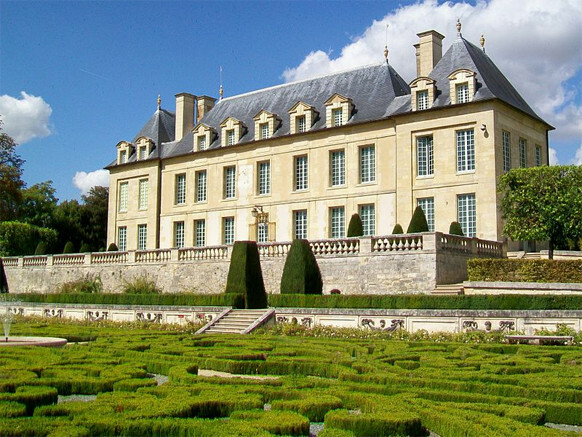 There is a lot to see – for example galleries, art and Marie Antoinette’s bed! You have to take a day off your calender to have enough time to explore this amazing place, in an relaxed pace… It’s a straightforward 40 minute train ride from Gare de Lyon to the Fontainebleau-Avon station. This is a local train you needn’t book in advance. If you’re headed for the castle then take the ‘Ligne A’ bus destined for Les Lilas, alighting at the ‘Château’ stop. Or else you can walk approximately 35 minutes. Fontainebleau, and it’s amazing castle.. One of the most visited monuments in France! This were my recommendations for trips from Paris by train… Hope you enjoyed the guide I completed for you, if your wanderlust outside of Paris increases.